Customer lost cooling operation in late May, and the service technician found the compressor had failed—a costly repair. This large 1990’s house had some comfort issues, the worst was cold rooms upstairs all winter, especially over the garage. 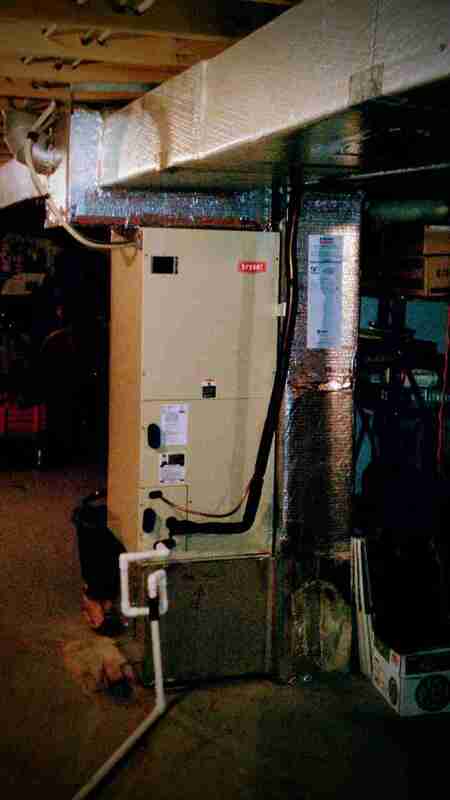 These are common complaints with heat pumps, and long duct-runs. A gas main had been added to the neighborhood, and the house was close enough to the street to have the connection, service line, and gas meter installed at no charge by Columbia Gas. This made a gas-fired furnace – an electric to gas conversion – a viable option. I recommended our favorite furnace, featuring high efficiency combustion, two-stages of heat, and the thrifty variable speed ECM blower motor. The result is longer run-cycles of medium-or-full heat as determined by the new thermostat, plus more even mixing of air between both stories and both ends of the house. 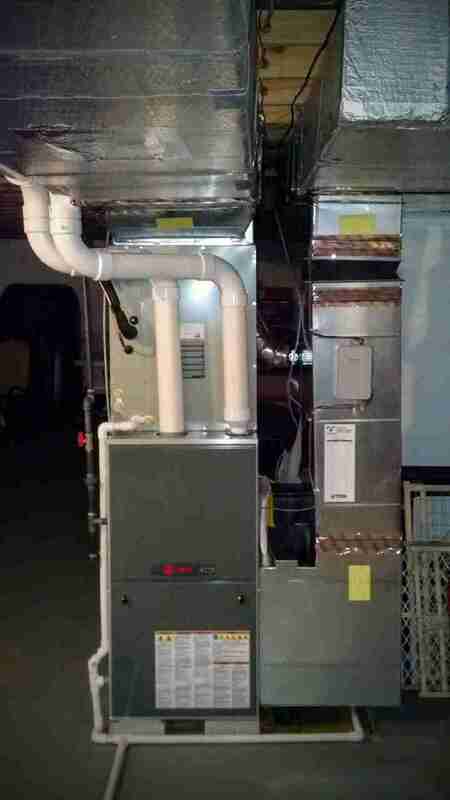 The proper capacity mid-tier, single-stage XL15i air conditioner was added, along with a matched indoor coil, new refrigerant lines, a new filter rack, Honeywell advanced bypass humidifier, required metal ductwork, and new PVC vent pipes out the end wall trimmed with a decorative cap. 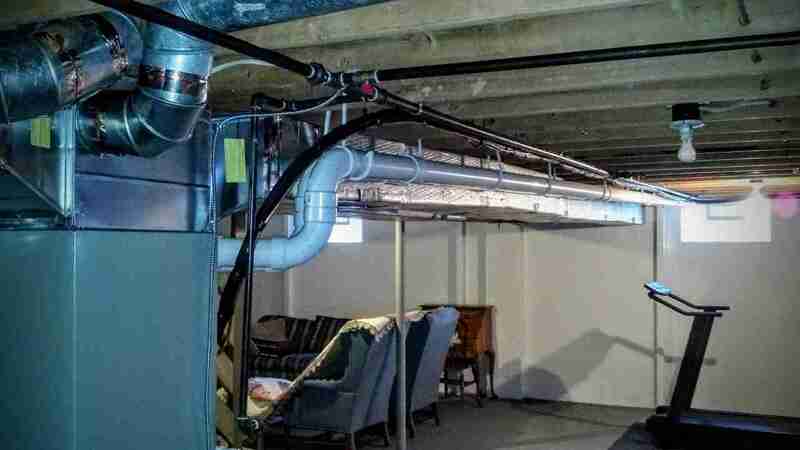 Their plumber installed a gas train through the basement, and added some taps for potential future uses. Scott, we had all an electric home and budgeted for $229 a month. We lowered that budget amount to $129/month. I would say we probably did save around $1,000 for the heat season. Our friends and neighbors still have all electric and their bills were over $400 during really cold month (they do not have a budgeted amount). You certainly may use my comments. Memorial Day – hot and no air …. Yea, I remember! Thanks again for your assistance. You and the Custom Air team made the process painless. Carolyn S.
We also went from all electric home to gas conversion. Our furnace was original to the home Circa late 70s air conditioner from the 90s. Scott Haring was great to meet with and explain everything and coordinate the gas conversion and installation which was a project, but very worth it! Bills are much cheaper in Winter and Summer! Also house is much warmer than ever before with electric. We went with York brand and are very happy with the products and staff of Custom Air! Hi Tiffany, thanks for the update. You were wise to convert to gas before the “longest coldest winter ever.” Glad to hear the house has become comfortable. Routing the new furnace vents out over your laundry room was a little tricky but we found the solution. Please tell all your neighbors in Grove City that I can help them too.